This year, the College of Licensed Practical Nurses of Alberta (CLPNA) is doing something different to celebrate National Nursing Week. 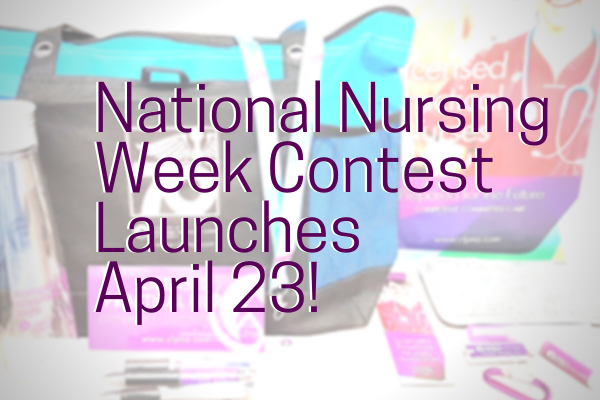 Starting April 23, take the National Nursing Week Quiz to be entered to win a sweet swag bag of LPN-branded items! Due to an overwhelming response for these items in the past few years, we are switching things to encourage LPNs to discover other resources the CLPNA has to offer. We want you to see we have more for you than free lip balm, like valuable education, informative videos, and interesting policies and guidelines to guide your work. Please share this information with your LPN colleagues. This contest will be only open to LPNs registered with CLPNA. Keep an eye on your email on April 23 for more details. I work as an acute care manager and I am a registered member of CLPNA. I know that during nurses week my staff look forward to the free swag that is sent out to them. I also know that the staff here use the site often for education and guidelines. I am not sure that they will be happy with this approach. I work as a Care Manager in Supportive Housing, I am registered with CLPNA. Our staff uses the site for education and policies and guidelines as I do. We are disappointed that swag for nurses week is no longer. I know they looked forward to the swag. I’m a Chapter chair for 3 sites. I a very disappointed that CLPNA that they will not be contributing towards nursing week with swag. I feel that our members use education ads from the employer. We pay our dues and some of the membership feel that our governing body is not doing enough for them. Swag shows them that they are appreciated. Your reasoning of having an overwhelming response to receive swag means LPN’s are looking forward to receiving various swag, as an appreciation from our licensing body for our continued work. Sadly, it’s sometimes the only “thank you” we will receive. Seems counter-productive to have a success on your hands then stop it. Maybe some better idea’s will prevail.